Sarah Palin: Big Tent Republican? Foreign policy rarely wins or loses elections but a couple of observations after Sarah Palin endorsed Rand Paul in the Kentucky Senate GOP primary over Secretary of State Trey Grayson in the race to succeed the retiring Jim Bunning. 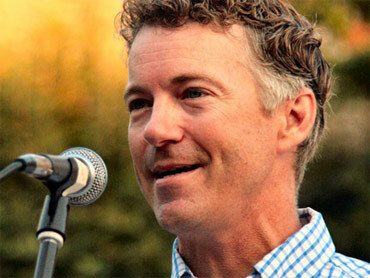 Rand, like his Texas Congressman father Ron, the junior Paul never bought into Republican claims that toppling Saddam Hussein was vital to American national security interests. Here's the Paul plank. Also, take a look at this seven minute video clip Paul did where he looks into a camera and spells out his concerns about current U.S. foreign policy as well as abuses in the national defense procurement cycle. In contrast to Palin's rote recitation of justifications for overthrowing Saddam, Paul says he would have voted against a declaration of war against Iraq. During the runup to the U.S. invasion, he says that there "was some question whether intelligence was manipulated." "The strange thing about Hussein and Iraq is that we actually had been their biggest ally for 20 years because we saw them as a bulwark against the Iranian dominance of the region so I don't think there was a reason to go into Iraq," he said. Another point of departure from Palin's foreign policy positions: Paul rejects the notion that fighting "them" over there relieves us from fighting terrorists on U.S. soil. He also questions the notion that U.S. policy in the Middle East is killing more terrorists than it creates. And then this leftist, um, libertarian-Republican questions the bedrock assumption held by many Republicans that it's possible to balance the budget by going after welfare queens is baloney. The reason: The military-industrial complex - which he mentions by name. "We give billion dollar contracts to Halliburton and they turn around and spend millions on lobbyists to go ask for more money for government so it's an endless cycle of special interest lobbyists then the weapons we decide make - we're being influenced by the makers of weapons on which are the best weapons. That's a crime." In a statement her PR flak provided to the Washington Post, Palin acknowledged that policy differences exist with Paul. Still, she's bestowing the Sara mark of approval. "I'm proud to support great grassroots candidates like Dr. Paul. While there are issues we disagree on, he and I are both in agreement that it's time to shake up the status quo in Washington and stand up for common sense ideas." There you have it, folks. Sarah Palin. Big Tent Republican.